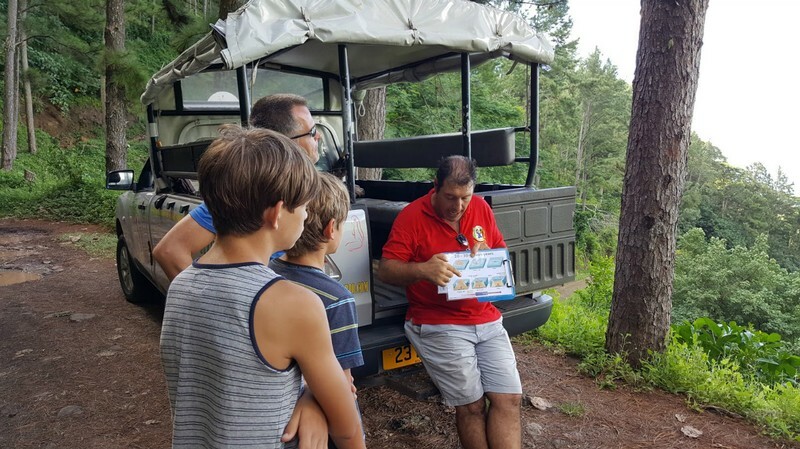 An Amazing Family Get-a-way and Educational too! 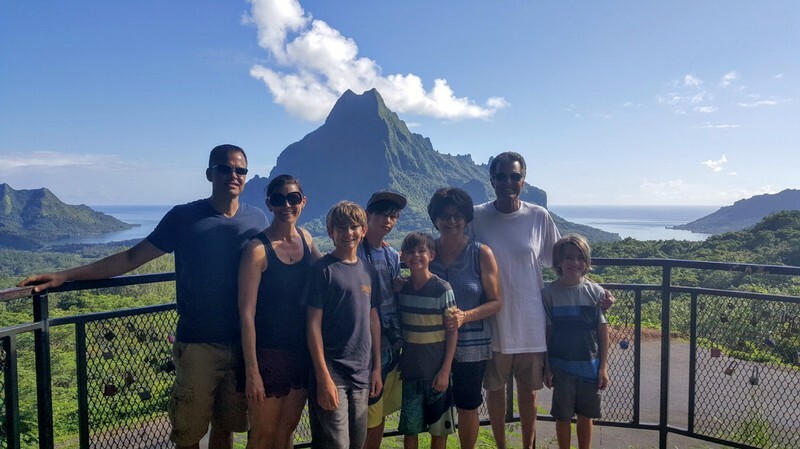 We recently returned from a two week trip to French Polynesia with our family. This was not our first time there and so we knew it would be superb with turquoise blue water and lush rain forests. But what we didn’t know was how educational it could also be. Since it was not a summer break for us, I was extra alert about having this be an experience that included more than just fun in the sun. I didn’t realize I wouldn’t have to try very hard. There were educational opportunities everywhere we turned. 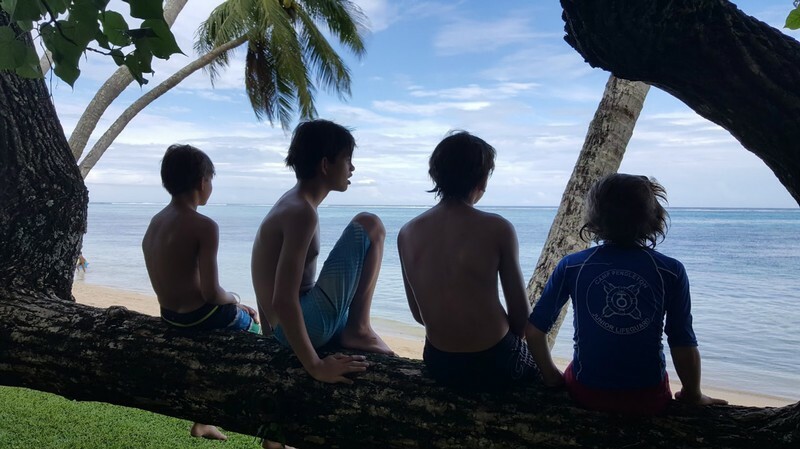 During our two week get-a-way, the boys learned so much about the history, culture, geology, plant life and animal life of the South Pacific. Take a look at what we learned, where we stayed and how we prepared for the trip ahead of time. Typically it’s just our family of four when we travel. For this trip, however, we invited my parents to come along with us. Then we discovered that Air Tahiti Nui was running a special where children fly free with an adult fare. So we also invited each of our boys choose a friend to bring along. This was a first for us, taking along a couple of extra kids. While I would not suggest this at an earlier age, it worked out perfectly for our 10 and 12 year old boys. Their friends that came along (also brothers) were fun to be with, excellent swimmers, and provided that extra person to do something with when your own sibling can sometimes get on your nerves. For our first week we stayed on the island of Moorea. 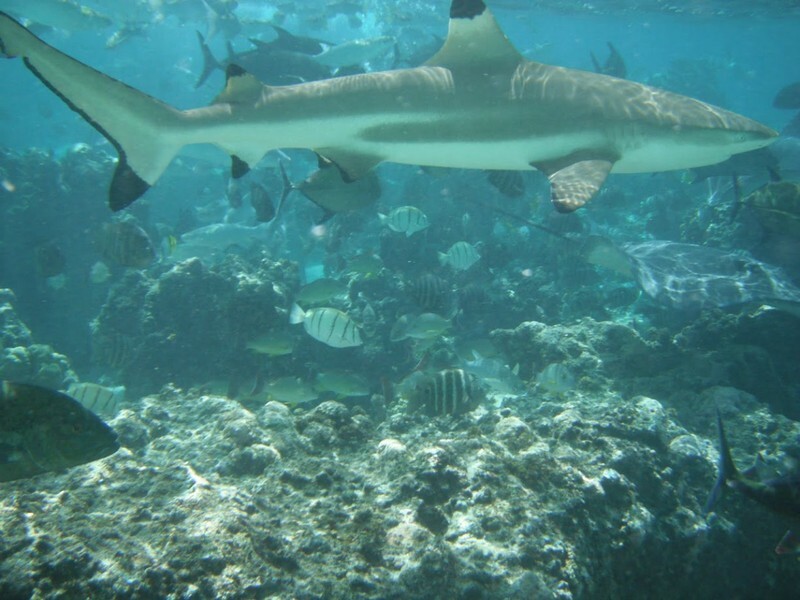 It is located just off the coast of Tahiti and just a short 30 minute ferry ride away. All flights into French Polynesia arrive at the airport of Papeete located on Tahiti. When we travel sometimes we like to stay in hotels and sometimes we like to rent houses or apartments. For this trip we decided to do half and half. We planned to rent a beach house on Moorea and stay in a hotel in Bora Bora. We rented the house through HomeAway and had a great experience. We’ve also used VRBO and Airbnb and have liked them all equally. 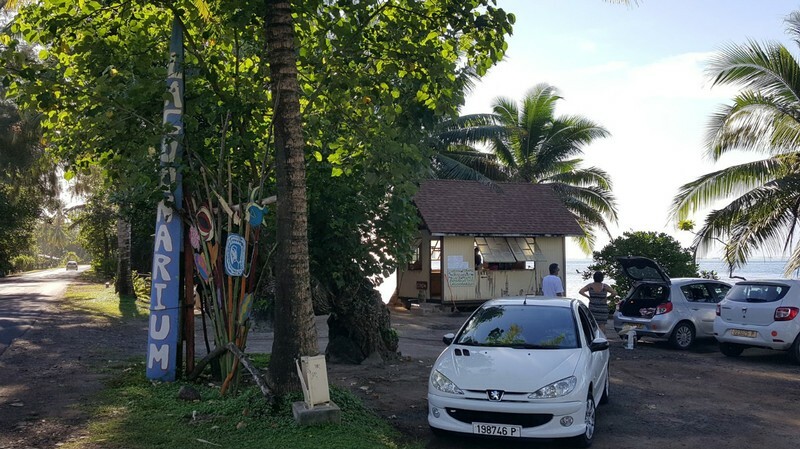 So once we arrived at the ferry dock on Moorea, we walked across the street to the Euopcar Rental office (in a little grass hut), picked up our car and off we went. The island of Moorea is pretty rustic. There is one road that goes all around the perimeter of the island. The total distance around the island is 36 miles and there is not one stop sign or traffic signal. Instead you’ll drive through little towns and pass lots of lose chickens and dogs. We arrived at our beach house and were immediately in love with this house and its location. It was right on the beach with a beautiful lagoon just steps from the back door. The boys couldn’t contain themselves and immediately found their swimsuits and ran straight for the water. 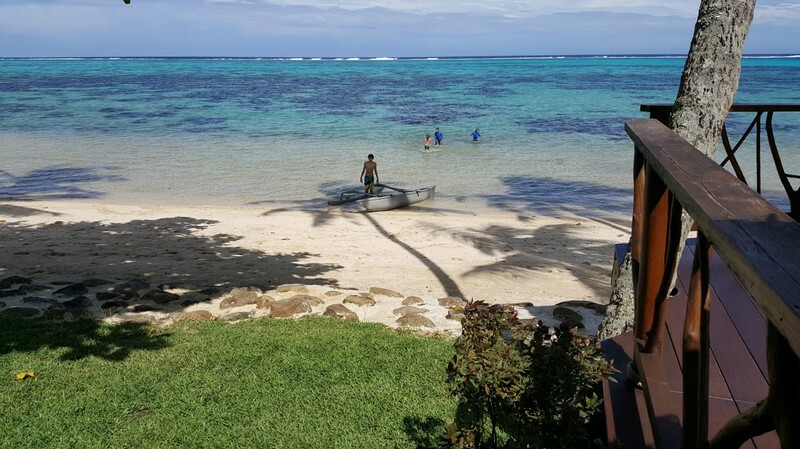 Honestly, on most days we just stayed at the beach house and… well, we swam, snorkeled, kayaked, relaxed in the hammock, counted the stingrays that passed by… you get the idea… But on two separate days, we planned an excursion that we were very happy with! What a special spot this was! If it wasn’t for Tripadvisor, we would have never found it. Just a little road-side stand and a little sign, you could easily drive right by and not even notice it was there. We arrived first thing in the morning with our picnic, sunscreen, snorkeling gear and cash (FP francs). They do not take credit card. The cost is very reasonable at $35 dollars per adult and $25 per child. 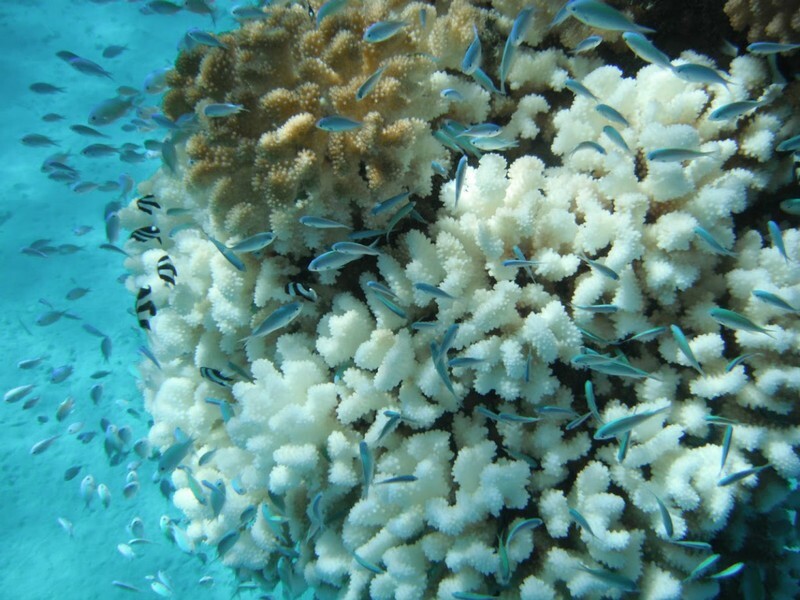 And what you get for that fee is a boat ride out to a little motu with an amazing coral garden for snorkeling. By arriving first thing in the morning we were on the first boat out and guaranteed a little grass hut we could call home for the day. Willfred is the very friendly Frenchman who runs this place. I think he lives on this little island with his 4 dogs. Every day at 11:30am and 2:00pm he does a shark and stingray feeding. All guests are invited to get in the water and participate. It’s quite amazing. The boys even got to ride on the stingrays. These rays having been showing up for Willfred’s feedings for 16 years. Their barbs have been removed and they are completely safe and friendly. In addition to the feeding times, guests can snorkel around two different rope courses that take you on a beautiful course. The ropes are helpful since the current can be strong. We enjoyed our time here so much we didn’t leave until the last boat out. For something completely different, we decided to do a land tour. There are a number to choose from, but we picked Safari Mario because of his high reviews on TripAdvisor. 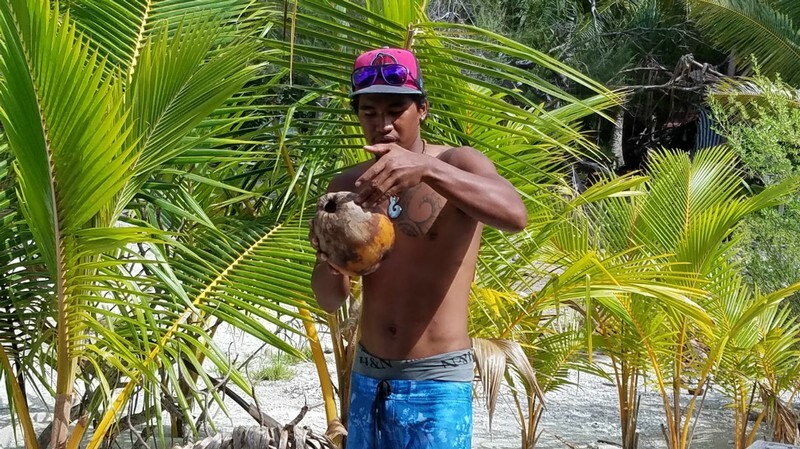 Mario is a very friendly Italian who has made Moorea his home. Like many immigrants, he came on vacation and decided to stay. Mario picked us up in his open-air jeep with bench seats. Our first stop was Mountain Magic with breathtaking views. We also visited a fruit garden, distillery, pineapple fields, an ancient temple and Belvedere Lookout. Mario was fun to be with and the entire journey ended up being very educational which I appreciated. It was also very interesting for the adults. 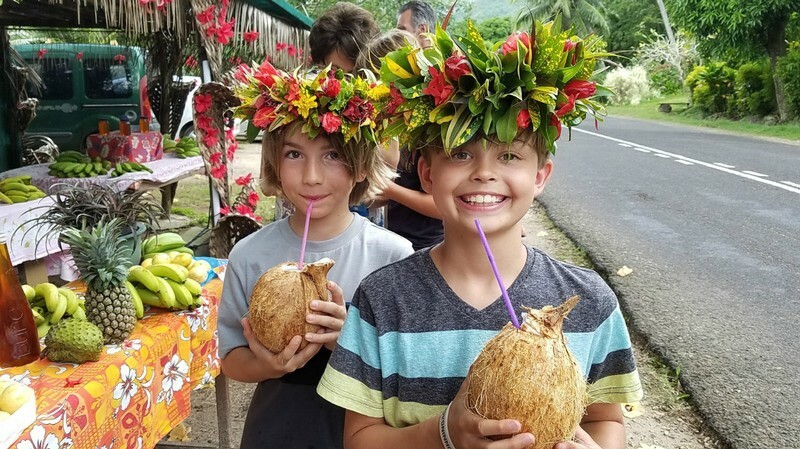 We learned about the history of French Polynesia from ancient times and European explorers. We also learned about the geology of the islands and current events such as industry, imports and exports. For food, we mainly shopped at the local grocery store and prepared our own food. We did eat out a few times, using Tripadvisor recommendations or local recommendations from people we met. We enjoyed Moorea Beach Club and Allo Pizza. 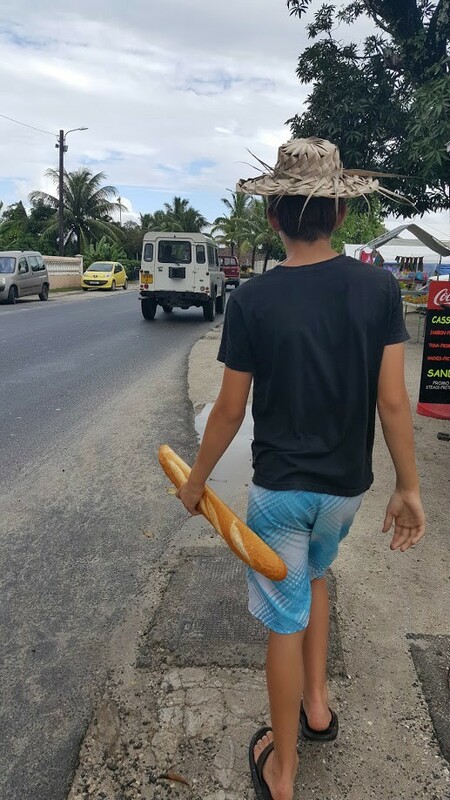 Food in French Polynesia has major sticker shock. Remember, just about everything is imported and it shows. The most reasonable food to purchase is the plentiful amounts of fresh French bread. A loaf of French bread ! We found that we didn’t save a lot of money by preparing our own meals, it just made it easier with the kids. To give you an idea of cost, a jar of peanut butter at the grocery store was $12.00. We also packed a good supply of our own granola bars, trail mix, etc. so that we could have snacks on hand. 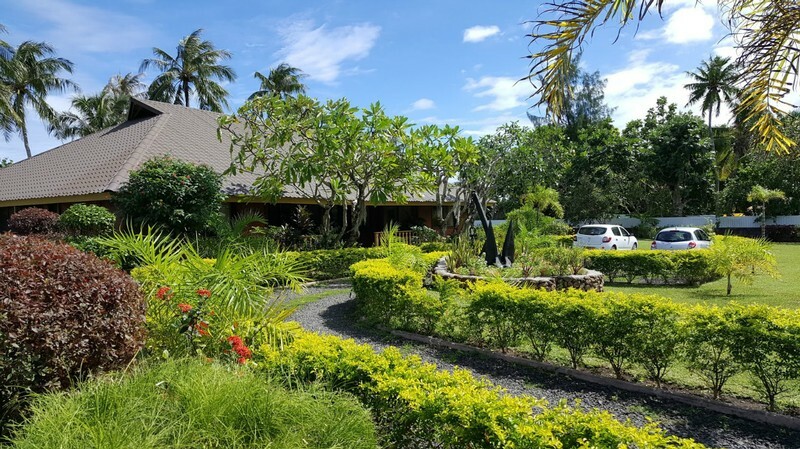 We found that renting a car, renting a house, staying away from the big resorts and just living amongst the locals had a completely different experience that staying in one of the fancy resorts. We encountered very few people who spoke English. There was no one in the grocery store, or the bank, or in the shops that spoke English. The only English speaking we encountered was in the restaurants. In French Polynesia, 60% of the population speak French and 30% speak Polynesian. This didn’t bother us at all and everyone was very friendly. We only wished we had gone more prepared. We had to settle with phrases like merci beaucoup and bonjour and a good effort at charades. (Since we had only stayed at resorts on our previous trip to French Polynesia, we hadn’t experienced this before). Then our time on Moorea had come to an end. On one hand we were sad to leave, but on the other, everyone was anxious to get to Bora Bora! 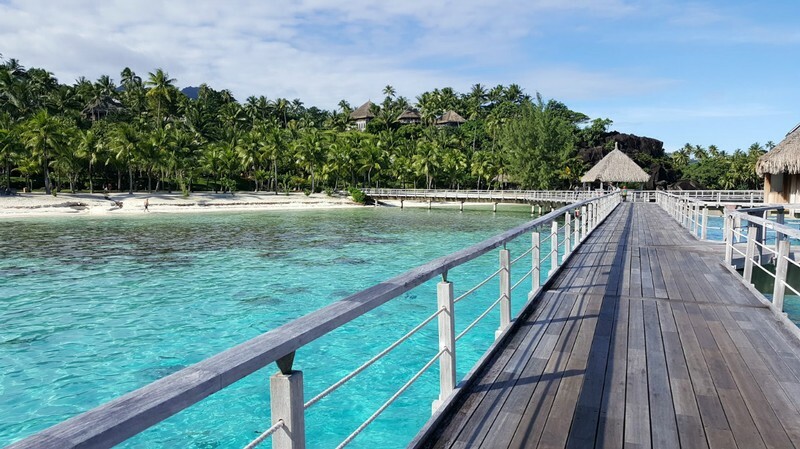 We chose the Hilton Nui Bora Bora. We have stayed there before and also the Four Seasons. 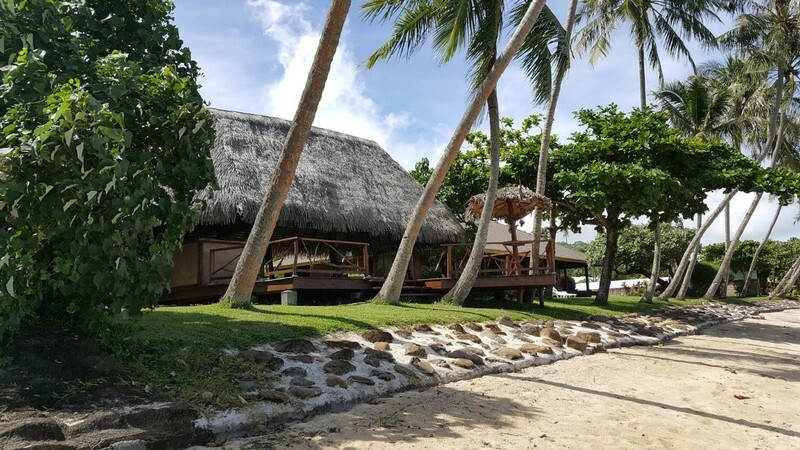 We went with the Hilton because of its down-to-earth and simple Polynesian style. We also like how the over-water bungalows are around sections of coral reef that make snorkeling right off of your own deck very appealing. 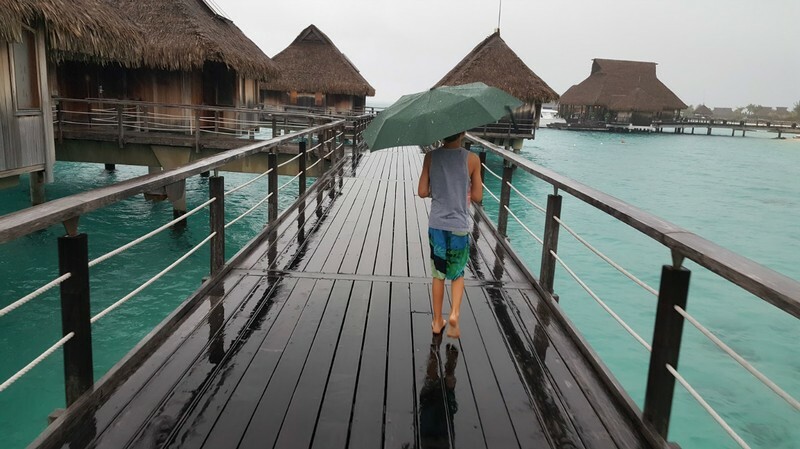 Unfortunately half of our days on Bora Bora were drenched in rain. And I don’t mean just a little shower that keeps you off of the beach for 30 minutes. I mean pouring rain all. day. long. So we made due (what choice did we have?) and got school work done, read books, watched movies, and ate. 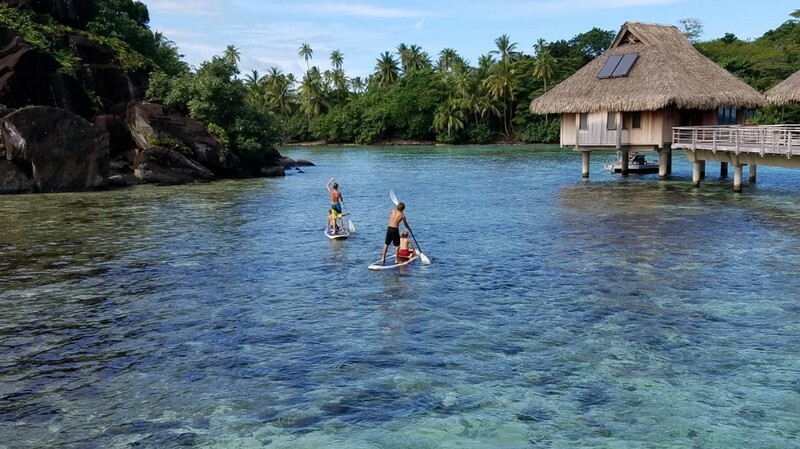 But we did have a couple of good weather days and we thoroughly enjoyed the Hilton’s free paddle boards, kayaks, and abundant opportunities for swimming and snorkeling. Book Through the Hotel or Book Your Own? We also enjoyed three different excursions and highly recommend them! 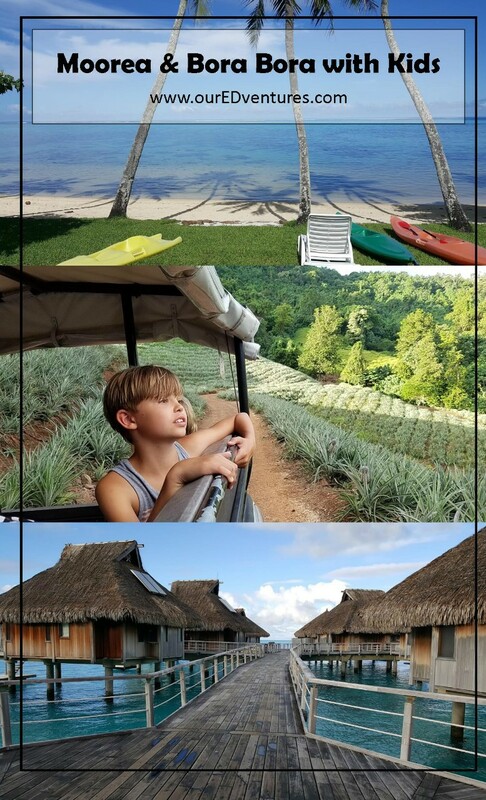 Many people staying at resorts book their excursions directly through the resort. While we have done this in the past, we generally try to book our own for two main reasons: 1) To save money. The same exact tour with the same exact company will have an increased surcharge when booked through the hotel. 2) We like being the ones to pick the company we are booking with. 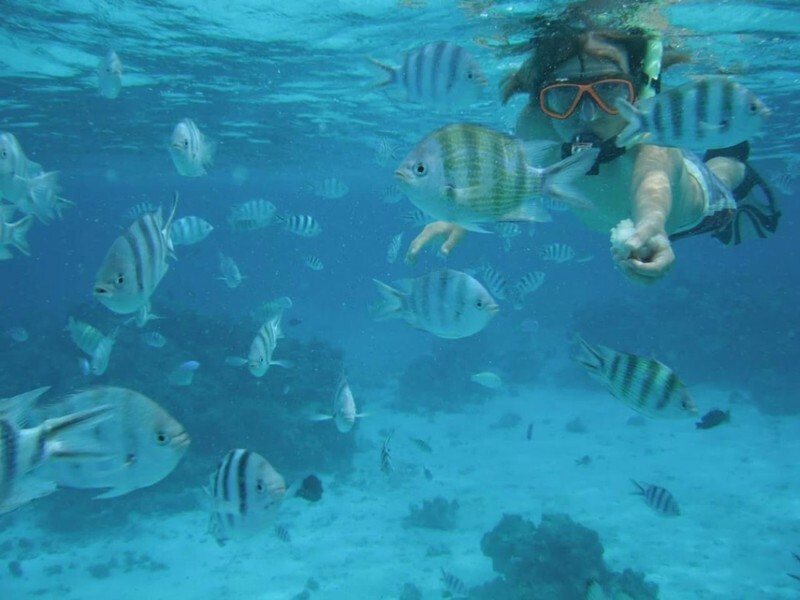 On a previous trip to French Polynesia, we booked a snorkeling excursion through our hotel. The company they sent us out with did not meet our expectations. With a crazy ukulele-playing skipper that cared more for the sound of his own voice than the safety of his passengers, we were not impressed. My husband even had to jump in the water and help a few elderly passengers who were having trouble, while our skipper just sang and laughed. So needless to say, I like to choose the tour operator we will be spending the day with. I find that customer reviews are very helpful. Even if safety is not an issue, it can still have a significant impact on the quality of your experience to spend the day with the best that is available. 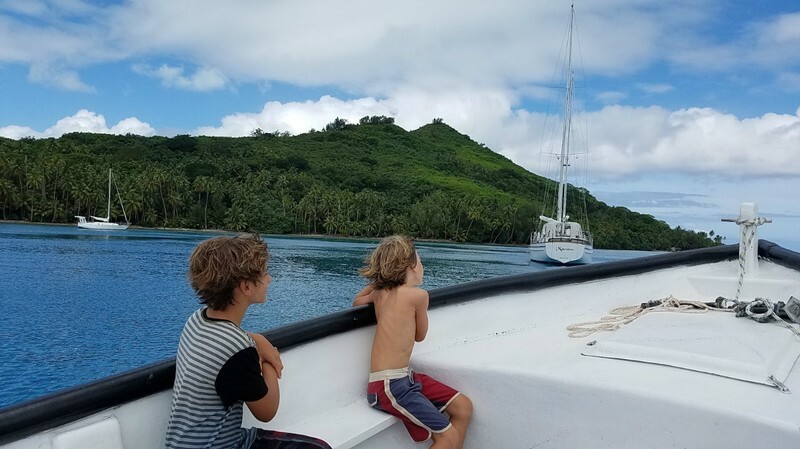 Knowing that some of Bora Bora’s best snorkeling spots are only reachable by boat, we knew we had to book a special excursion to do just that. Again we went to TripAdvisor and chose one of the highest rated companies. We went with Pure Snorkeling. I liked how easy the booking process was, including the ability to book and pay online ahead of time. 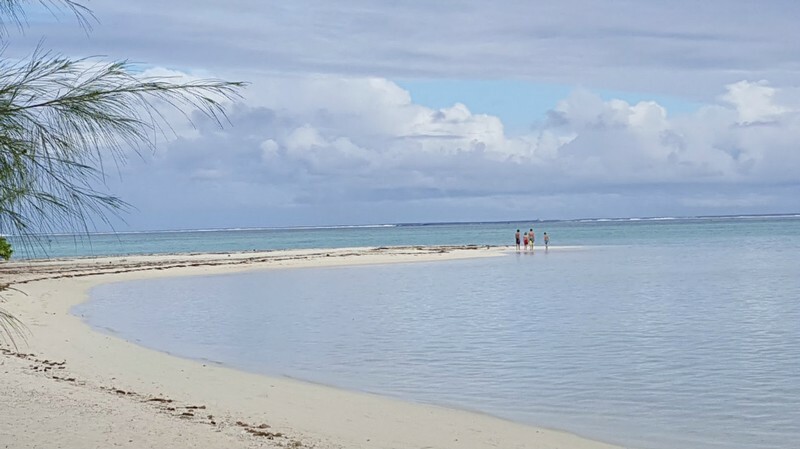 Many of the tour companies throughout French Polynesia only accept cash and that can be pretty inconvenient. Ben was our guide and he picked us up right from the Hilton dock in a very nice and fast speed boat. 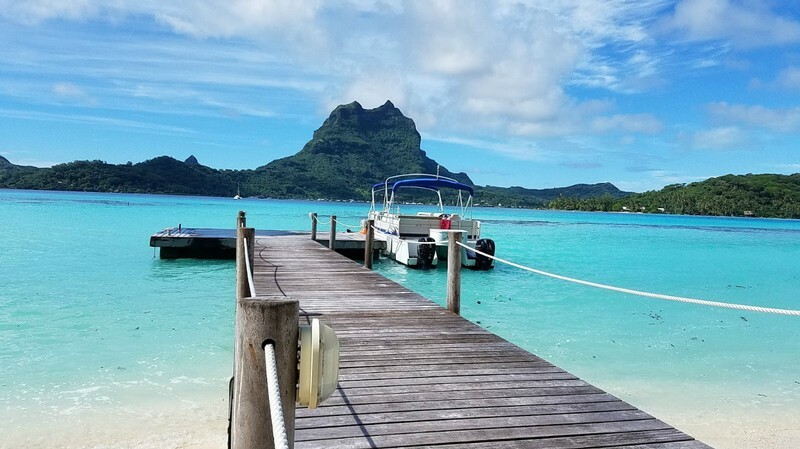 Our day would include four spectacular stops around Bora Bora. Stop number one was to find a manta ray and swim with it. Ben knew right what to do, and found our manta ray within the first 20 minutes. We all got out of the boat and glided along with this majestic creature for about 30 minutes. It was truly amazing! Then we made three more stops, each unique and still having that WOW factor. We swam in a coral garden of which the brilliant colors I have not seen anywhere except Bonaire. 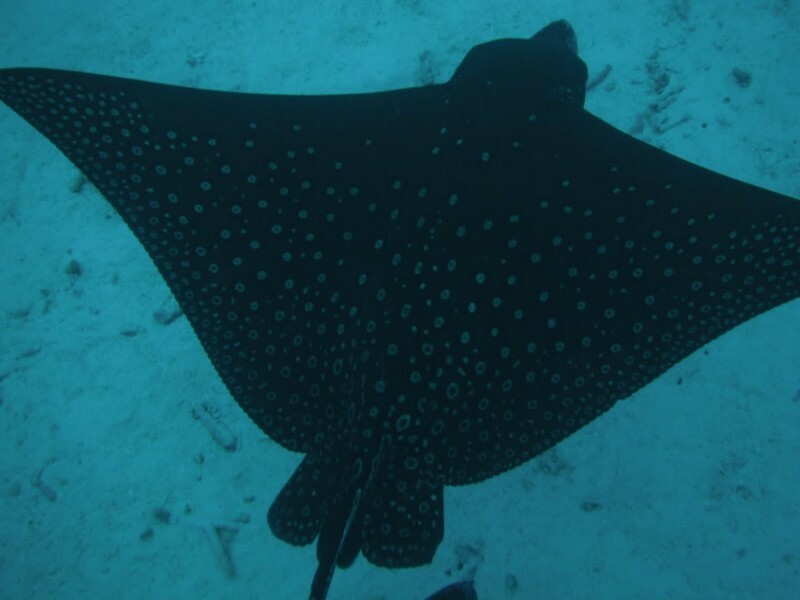 He also found a large school of eagle rays that we got to swim with. 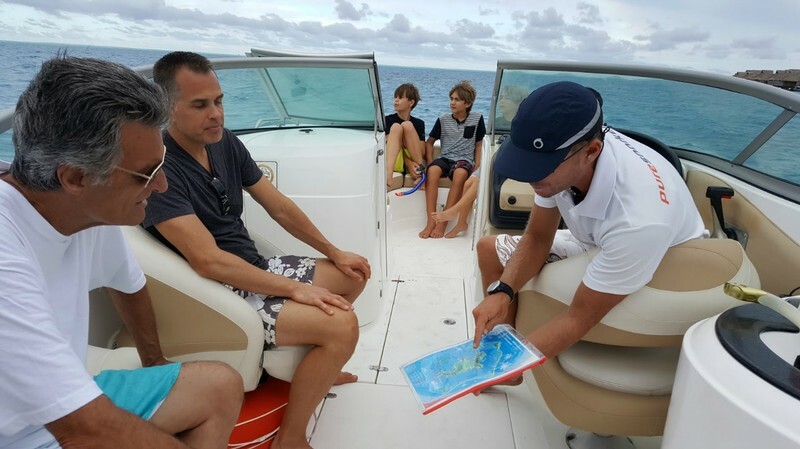 Ben provided a lot of educational information about sea life, geology and even World War II history. He was friendly and safe and very good with our four kids. We truly had an incredible day and so glad we went with Pure Snorkeling. 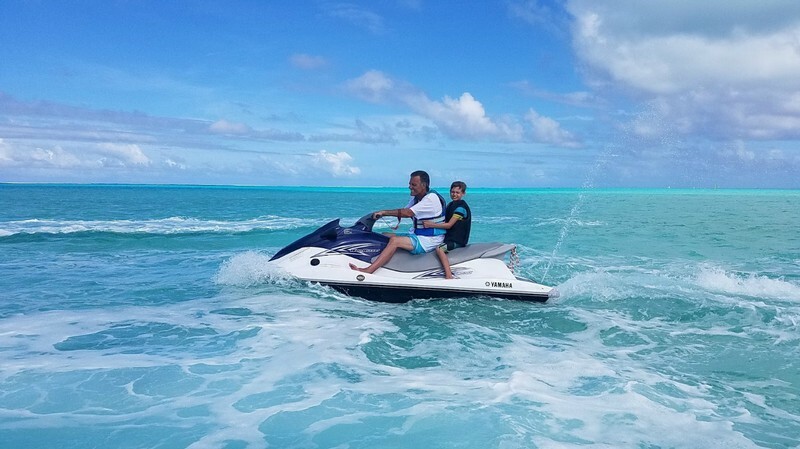 A really fun way to spend half a day is to ride around Bora Bora on a jet ski. We had 4 jet skis (an adult and a kid on each one) and a guide that went with us. Moana picked us up at the Hilton dock in a boat and drove us over to where the jet skis were kept. We got a quick safety talk, put on our life vests and sunscreen and off we went. There is a handy compartment in the front that’s perfect for your shoes and any valuables. A water-proof camera is a fun thing to bring along. The water was a little choppy, but we still had a great time. It’s amazing to go over water that’s deep blue and dark and then just a few minutes later to be going over clear turquoise water that is shallow. We made a couple of stops along the way. Our guide pointed out things of interest as we went. Our favorite stop was a little motu where we had a demonstration on how to open a coconut with nothing more than a stick and a rock. It was quite impressive. 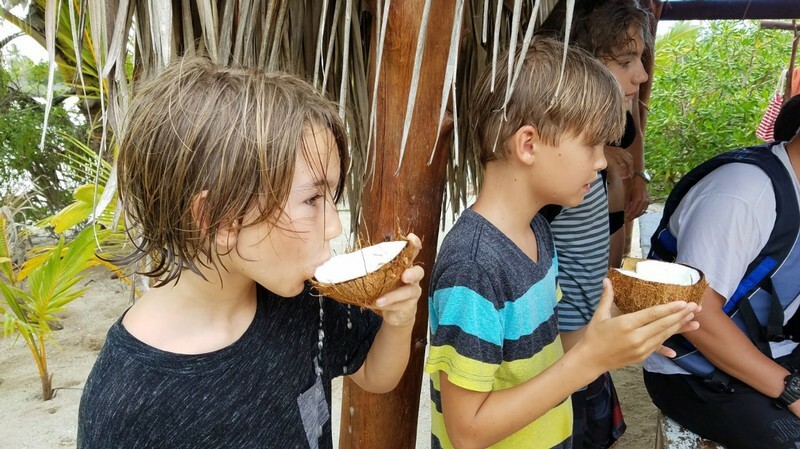 Then we got to drink the coconut water and eat the fruit. YUM! Plan ahead because Moana only accepts cash. 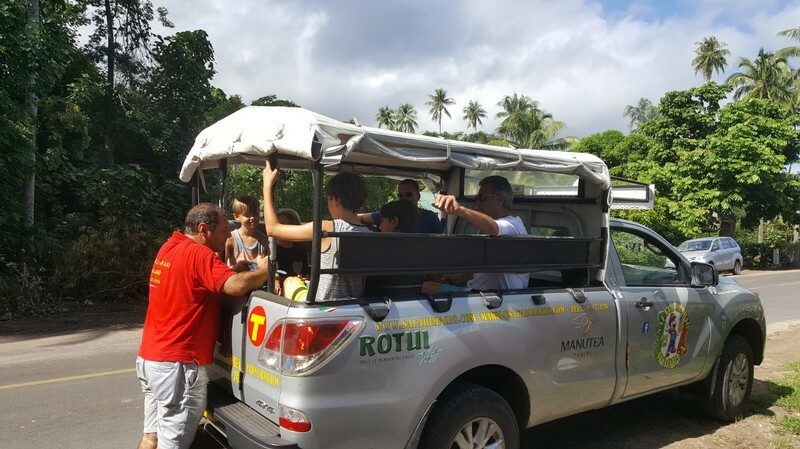 We called our bank to ask them to extend the maximum withdraw amount and then Moana tours made a stop for us in the town on Vaitape to use an ATM machine. In this regard, it would certainly be easier to just book the excursion through the hotel. However we felt like the extra effort was worth the savings. We paid 50% less by dealing directly with the tour operator. 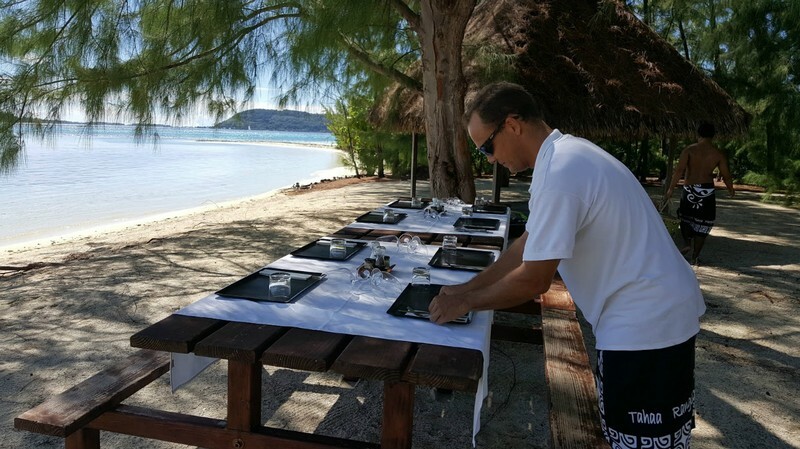 As if we needed a grand finale on this already over-the-top vacation… but a grand finale was exactly what we got when we booked a half day at the Hilton’s private motu with an elegantly served picnic lunch. It was our last day. We would be leaving that evening on a red-eye flight back to Los Angeles. So we decided to go out in style and boy did we! On the morning of our departure, we met two Hilton employees that would be our boat drivers, beach butlers, and waiters for our private island escape. 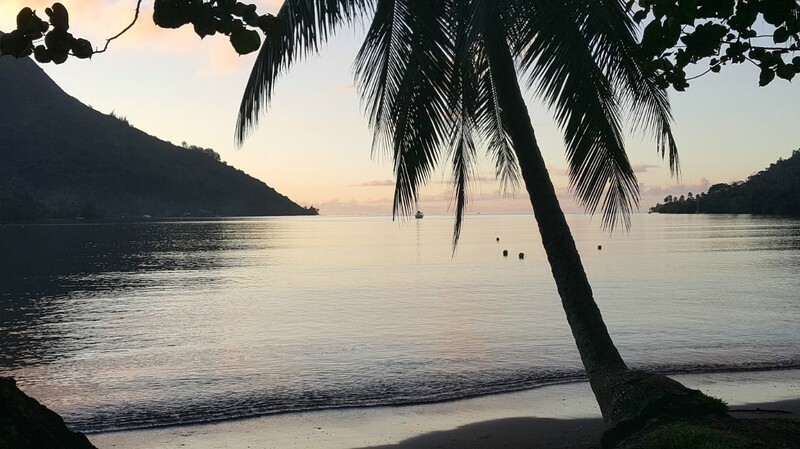 We thought, “What are we doing, leaving the beautiful beaches of the Hilton resort behind on our last day here?” But we were in for a treat that we did not expect. The boat ride took about 15 minutes. When we arrived at the island it looked nice and deserted, but it wasn’t until we walked through to the other side that we got a view of perhaps one of the prettiest beaches we have ever seen, and it was all ours for the next four hours. This beautiful spot... all to ourselves! We had a small shaded cabana, chaise lounges, a bathroom and a lagoon that extended approximately one mile out with an average depth of 2-3 feet for the entire lagoon. We lounged, snorkeled, floated on rafts, collected shells, explored the little island and the boys played hide-and-go-seek. We just kept saying, “This is amazing!” And it truly felt extra special that it was just ours for those hours. And then it was time for lunch. I expected the Hilton employees to drop off a picnic basket or something to that effect. Instead they set an elegant table on the shore with a white table cloth, china, silverware, our delicious picnic lunch and chilled white wine. And then just like that, our two week vacation came to an end. It was time to leave the private motu, time to pack up our belongings at the Hilton and time to catch our flight back to Tahiti so we could get back to Southern California. I found some great information about French Polynesia on Ducksters and Britannica online. 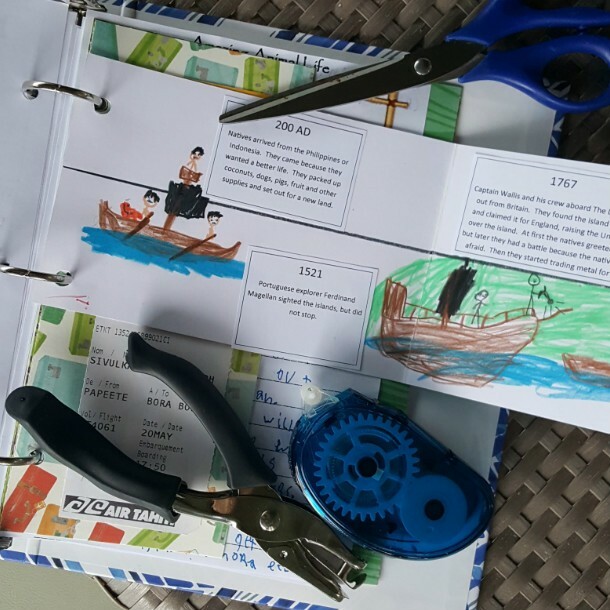 The boys each made a timeline that covered the earliest settlers (who they think were from the Philippines or Indonesia looking for a better life) through the European explorers, to how French Polynesia eventually came under French rule. Since we home-school, I just incorporated this into their history lessons in the weeks preceding the trip. It turns out it was very helpful for them (and us adults too) to understand so much about the people who call French Polynesia home today. We also took the time to learn about national symbols, currency, population, language and religion. We also made journals that we took along on the trip. The boys drew maps for each of the islands, labeling bodies of water, mountains and towns. They wrote about animals they learned about, exotic tropical fruit they ate, favorite memories and more. These were great to work on especially during those rainy days. Check here for books with a tropical island theme. Although none of these are specifically about island life in French Polynesia, they would each be fun reads for an island vacation. During this trip my 12 year old read the young adult adaptation of Unbroken by Laura Hillenbrand. Since most of this biography takes place in the South Pacific and we also saw remnants of World War II, it was a good fit for him. He really enjoyed this book. 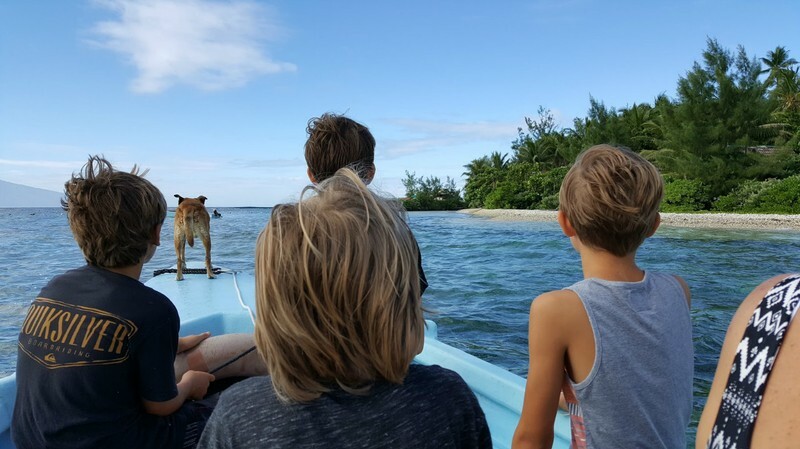 So there you have it: our spin on adding some educational qualities to an amazing tropical, beach, family vacation. I am a firm believer that education simply happens when you travel. 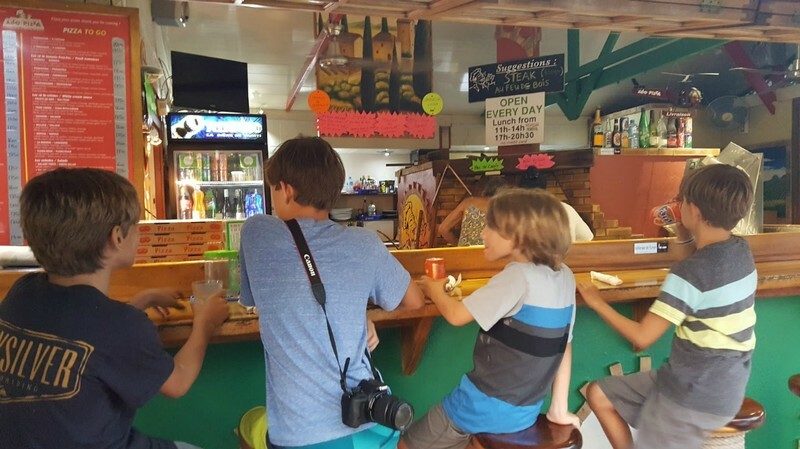 Whether you realize it or not, everyone in your family is absorbing the sites, the sounds, the culture, the history, the unique characteristics of the place you are visiting. But when you put a little effort into the educational side, the learning can increase ten-fold. How about you? 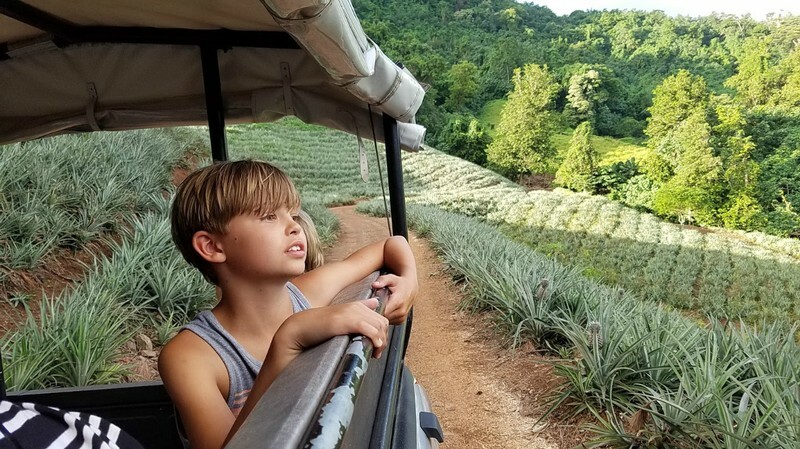 Please share your ideas for adding educational experiences to your travels. "This is a wonderful insight into your amazing vacation. I love enhancing our learning through travel and am a firm believer in that! My family gives me a hard time about it but I think they appreciate it deep down. Thanks for sharing!! 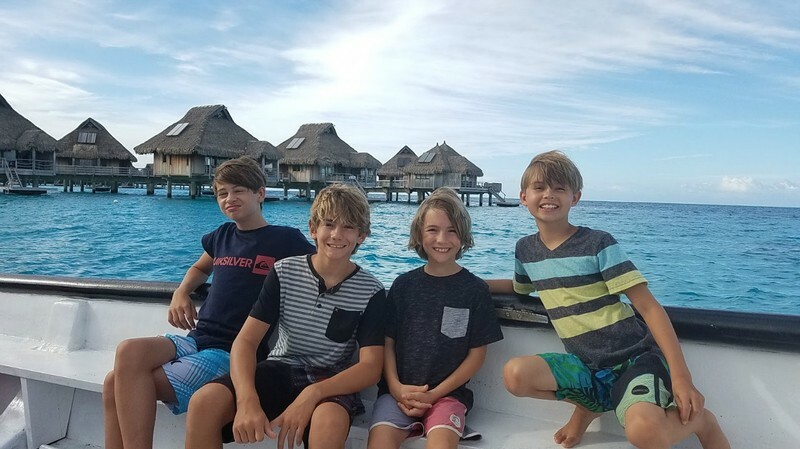 "I love seeing your take on educational trips, we have 3 boys and our goal is to expose them to the world through travel. 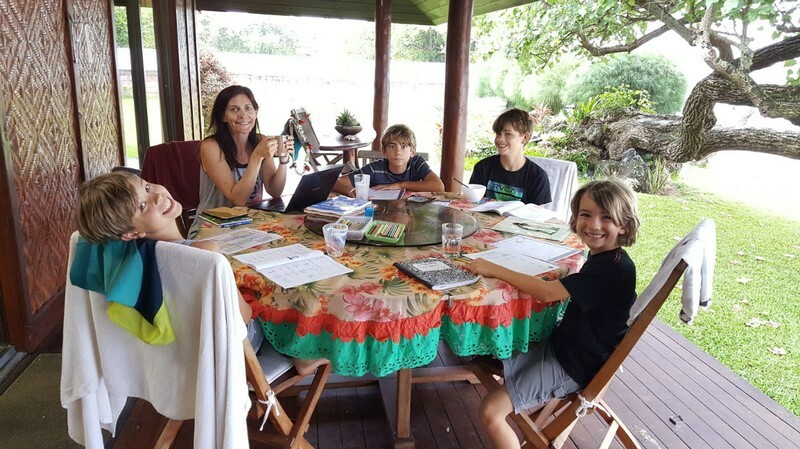 Our boys attend a hybrid Classical education School that is half home school and half in class instruction, with this set up we have had the freedom to take our boys (mostly my wife on her own with me joining as work allows) on many extended vacation. we are always looking for more ideas. We have done multiple month-long trips to Argentina and Chile, numerous trips to Costa Rica and my wife rented a house in the middle of Merida Mexico on the Yucatan for 2 months a couple of summers ago. Seeing your trip makes me want to visit French Polynesia and see what we can find. I admire you taking your parents along (I followed your mom on facebook and she looked like she loved it) our biggest challenge is that our 11 year old boy is disabled so we always have to factor that in and work with his capabilities. Thanks for the window into your travels.